One day I was at a retail store picking up an online order. A young woman in front of me approached the counter. She pulled out $8 from her pocket, and she asked the customer service person to add it to her prepaid debit card. Apparently, she needed the $8 on the card so she could use the card to pay for something she couldn’t do as easily with her $8 in cash. Apparently the $8 would make a difference. It’s a different way of managing one’s money. When you always have a large cushion in your bank account, traditional banking is very convenient. You have debit cards, credit cards, online bill pay, checks, and direct debit. However, when every dollar counts and every day counts, some of those conveniences get in the way. You don’t have control over when things clear and you don’t know exactly how much money you have available at any moment. A small miss means a $35 overdraft fee. A few misses in a month means you are out $100 or more. A prepaid debit card helps avoid overdraft fees. It offers finality, which is very important when you must keep a very close eye to your money. When you pay for something you want that money gone right away so you know how much is still left. With a prepaid debit card you can still have many of the same conveniences of a traditional bank account, but with clear visibility of your money and without overdraft fees. Green Dot is a pioneer in prepaid debit cards. They sent me a Green Dot Bank Cash-Back Visa Debit Card to try it out. The card came in a very secure and visually attractive clam shell package. You can buy this card for a small fee at a retail store or you can request one online at greendot.com. * Cards issued by Green Dot Bank, Member FDIC, pursuant to a license from Visa U.S.A. Inc. The money on the card is FDIC-insured. The first thing I did was to register the card to my name. I will receive a personalized card with my name on it in the mail. Some features are only available to the personalized card with your name, but the card without your name is ready to use right away. Registering doesn’t require a credit check. Because it’s a Visa debit card, I can use the card almost anywhere. With online access or through the Green Dot mobile app, I can see the activities and the remaining balance in minutes (carrier message and data rates apply). I used it to buy lunch, mail a package at the post office, and I used it pay a utility bill online. It worked smoothly. To put money on the card, you get a bank routing number and account number for direct deposit. For depositing a paper check, you can use the Green Dot mobile app. After you get your personalized card, you can activate bill payment. Just like online bill pay in a traditional bank account, you can pay bills through the prepaid debit card. 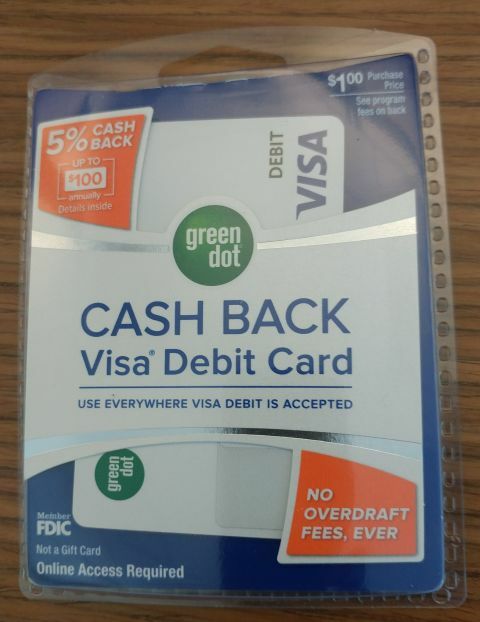 One unique feature of this Green Dot Bank Cash-Back Visa Debit Card is you earn 5% cash-back up to $100/year on everything you buy. Although the card charges a $9.95 monthly fee (other fees and limits apply), you get up to $100 in cash-back after one year. That makes the net cost of using the Green Dot Bank Cash-Back Visa Debit Card much less, compared to just one overdraft fee from a traditional bank account, for those who must keep close tabs on their money. Disclosures: Carrier message and data rates apply to mobile alerts and using the mobile app. Bill pay and mobile deposits are available only on personalized cards; limits apply. Other fees and limits apply. Green Dot prepaid cards are the cards of choice by thieves to make fraudulent tax fraudulent social security claims and tax filings. Green Dot has no relationship with any credit agencies nor do they utilize Chex Systems so it is very easy for a thief to open a fraudulent account. A thief recently used my husband’s information (probably obtained in the Equifax breach) to file for my husband’s heretofore untapped social security benefits and had the monies (over $19k) applied to the thief’s Green Dot card. Here’s a similar story: http://blog.aicpa.org/2018/02/social-security-benefits-hacked.html. We have been working for the last four months to get this cleared up with the SSA and are still awaiting a corrected SSA-1099 so that we can file our 2017 tax return. It has been a nightmare. Note that our credit was frozen before the Equifax breach but that doesn’t stop this type of attack since Green Dot opens accounts with no verification process. I believe you should reconsider promoting an unscrupulous company such as Green Dot. Seriously, $10 a month to use this? I don’t find any value in this when you can get a free debit card from a credit union free checking account. If you look around, you can still find such accounts. How Are U.S. Consumers Using General Purpose Reloadable Prepaid Cards? Are They Being Used as Substitutes for Checking Accounts? Out of the 25.47% of the adult population that have prepaid cards 87.6%, fully 7/8 of them, are “banked”. You’re blowing off 7/8 of the customer base of these cards. The Simple Dollar presents multiple reasons why one might use a prepaid card, echoing statements in the Fed report. Aside from using prepaid cards because of difficulty in qualifying for a “regular” bank account or because bank account fees (notably overdraft fees) are too high, prepaid cards may be used as an alternative to virtual credit cards for online security. Also, subaccounts on prepaid cards provide a simple way to manage kids’ spending. Those latter two rationales do apply to people like you and me. The cash back Green Dot prepaid card charges $4.95 for subaccounts. I can have subaccounts on my cash back prepaid card for free. If one wants or needs a prepaid card, Green Dot is considered by a major consumer rating publication to be one of the best. That said, one should be careful when comparing prices and features. The fee for a getting a card at a retail store can be as much as $4.95. The best way to avoid this is to order the card online for free. If one is not using the card extensively, it can be more economical to use Green Dot’s vanilla card. it won’t get you cash back, but it will cost $4 less per month. That card has ways to get its $5.95 monthly fee waived. The 5% cash back feature does appear to be unique in its high rate, but it is not the only card in the industry to offer cash back. I use a card from a competitor that pays 1% cash back with no limit. And I pay no monthly fee because I live in one of the few states where that card is free. One of Green Dot’s points of superiority is convenience. It’s easy to add cash and of course to use a Visa-branded card. Reloading cash in a store usually incurs a fee – not just for this card, but for most prepaid cards. This fee can be avoided by using direct deposit, or by linking to a bank account.